(KIA-POW-RTD) - Mission 313, 9 February 1945. Two 427th BS B-17's were lost due to a mid-air collision near the target at Lutzkendorf, Germany. Missing Aircrew Reports 12245 and 12229. B-17G 42-31060 Pogue Ma Hone, piloted by 1Lt Alfred K. Nemer and B-17G 43-39149 (No name) piloted by 2Lt Robert J. Barrat collided before "bombs away" after the 1Lt Nemer B-17 was hit by flak. The right wing of 42-31060 hit the tail of 43-39149. The rear part of the fuselage - from the waist window back - was torn from 43-39149. The aircraft was seen going down out of control in two pieces. Miraculously, the tail Gunner Sgt George H. Emerson managed to parachute out of the severed tail and became a POW. The other eight members of the Barrat crew were killed. Early in 1991 Harry H. Schulz was contacted by Group Captain Stanislaw Przbyski and was told that the City of Jarecin was building a monument to the Nemer Crew. 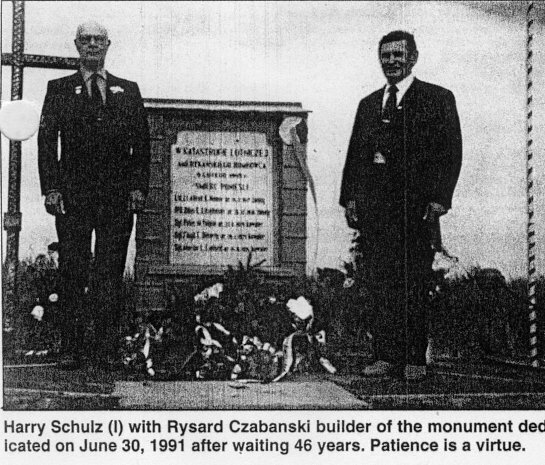 The monument dedication took place on 30 June 1991 in Jaraczewe, Poland about a mile from the crash site. Harry H. Schulz and quite a few dignitaries attended the dedication. See the monument photo here. 1Lt Alfred K. Nemer (P-KIA) - Mission 311 & 312 flown as CoPilot with a combat mission orientation Pilot; 311 - 1Lt Silas B. Ashwell Lead Crew; 312 - 2Lt Arthur Bluethenthal (CP) on 1Lt Ingersall J. Roberts Crew; Mission 313 flown as 1st Pilot. F/O Odus C. Litzelfelner (CP-KIA) - Stood down on missions 311 & 312. Flew on mission 313. 2Lt Alexander F. Marshall (B) - Flew with 1Lt Nemer crew on mission 311. Substitute Togglier used on missions 312 & 313 - T/Sgt Howard H. Ganson (RTD) from 2Lt Stanley E. Pursel Crew. 2Lt Marshall flew on 17 additional combat missions with eight different Pilots: As crew member -318, 319, 320, 321, 324, 325; As member of a PFF Deputy Lead Crew - 331, 333, 335, 339, 343, 347, 350; As member of a Squadron PFF Lead Crew - 353, 357, 363 & 364. Completed 18 credited combat missions. 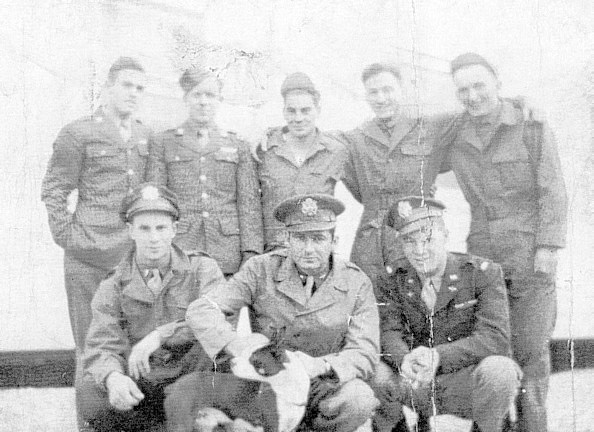 Other six crewmen - 2Lt Harry H. Schulz (N-RTD)), Sgt Floyd S. Bohrer (E-POW), Sgt Peter M. Volpini (R-KIA), Sgt Marion L. Canfield (BTG-KIA), Sgt Paul L. Kerr (WG-RTD), Sgt Floyd C. Doherty, Jr. (TG-KIA) - Flew on all three of the 1Lt Nemer Crew missions.